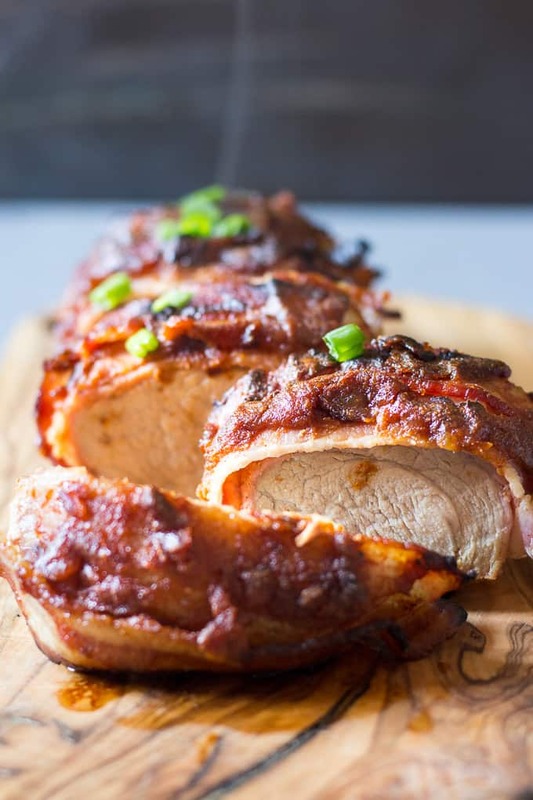 This Paleo and Whole30 Bacon Wrapped Pork Tenderloin has a sweet and smoky sauce that’s refined sugar free, incredibly delicious and even kid friendly! The recipe can easily be doubled for a crowd and the prep is just 10 minutes. I have been meaning to post this recipe for 6 whole months – no joke! Every single month, I scheduled it on my calendar and then kicked it off. 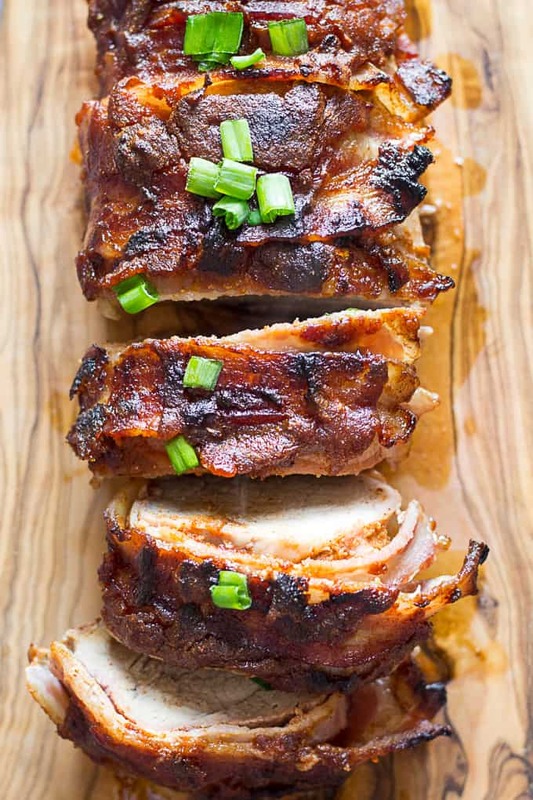 I can’t explain why – it’s my family’s favorite way to eat pork and actually the only way we eat it ever since I tried out the recipe last June. Nope, I definitely won’t be blaming the recipe since a.) bacon-wrapped anything is always delicious b.) 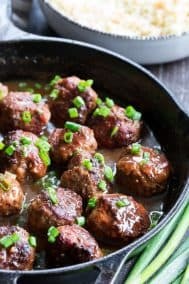 the sauce is downright drinkable – I know that sounds weird but it’s totally not, trust me and c.) it’s Whole30 AND naturally sweetened with dates. Although had I used dates to sweeten desserts prior to making this – it was the first time I used dates in a savory sauce, and, I was WAY impressed. So the recipe itself has nothing to do with why I’ve been hanging on to this one. In fact, I have a scary number of savory dinner recipes that I haven’t gotten around to posting for one reason only – the photo process makes me insane. Part of it is the timing (I have to cook dinner early – like 6 hours early – for optimal light) and part of it is the production of setting up a “dinner scene” when I’m the only one home, plus showing the meal in different stages of prep always seems to take forever. Whatever the excuses are though, I need to work through them ASAP! I’m thinking January will be the perfect excuse to cut the crap and start posting all these Whole30 goodies I’ve been postponing. 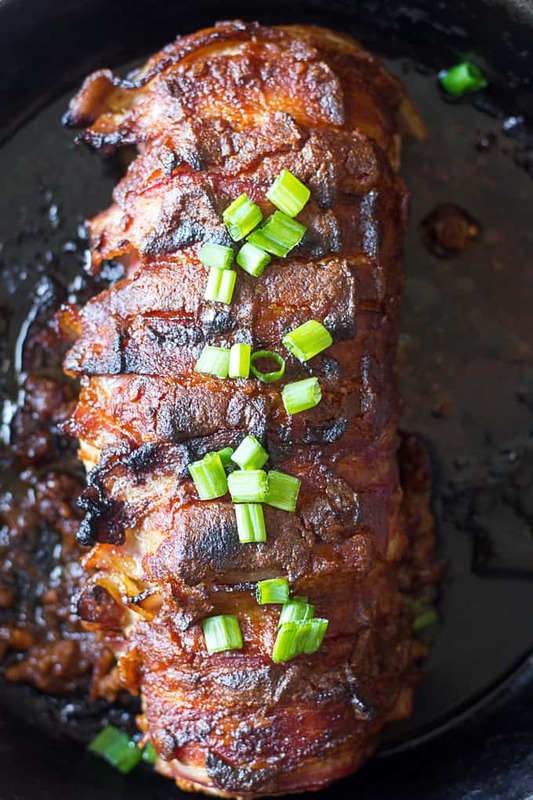 And now, back to this one – my bacon wrapped pork! 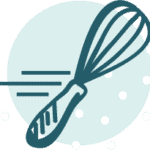 What I love about this recipe (um, besides what I already said?) is that the prep is seriously FAST! I used my food processor to put together the sauce and it took about a minute. 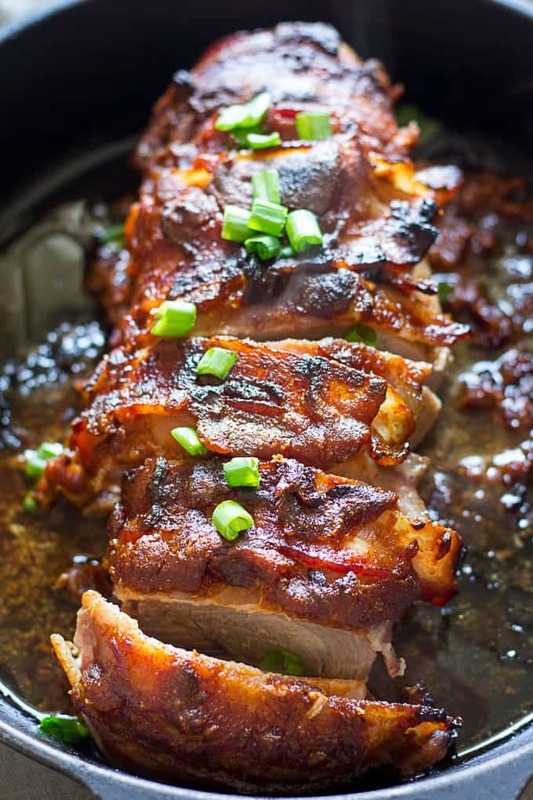 There’s no marinating prior – just pour half the sauce on the pork, layer on the bacon, pour on the remaining sauce, and roast. It’s that simple! Pork tenderloins are skinny (I used a “fat” one and it was still relatively narrow) so they cook fast in the oven. Depending on the size of your pork, you’re looking at at 30-40 minute cook time. Plus, you’ll still have room in your oven to roast some potatoes or other veggies – I roasted my pork at 400 F which is also a good temperature for veggie-roasting! I wouldn’t want to be left in a bind with no roasted potatoes – I don’t think you’d like it either. 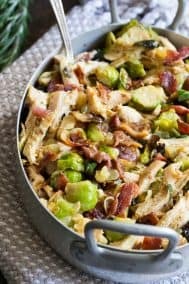 This recipe is also easy to double if you’re cooking for a larger family, a crowd, or want leftovers – the cook time will likely change so make sure to take the temperature of the meat to know for sure that its done. Are you ready for smoky-sweet bacon wrapped deliciousness? Let’s go! 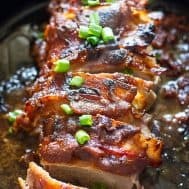 This Bacon Wrapped Pork Tenderloin has a sweet and smoky sauce that's Paleo and Whole30 friendly and even kid friendly! The prep is just 10 minutes and the recipes can easily be doubled for a crowd. Roast in the preheated oven for 35-40 minutes or until internal temperature reaches 155 degrees. If desired, place under the broiler for 5 minutes or until bacon is crisp. Allow the meat to rest 5-10 minutes, then slice and serve - enjoy! Want more Paleo and Whole30 family dinner ideas? Try one of these! Have you used dates in savory sauces? Would you like to see more dinner-type recipes? They are on their way! I need some too actually! I’ve gotten into my dinner rotation rut and I need to find a way out! Ooh… I love that you brought this out now; I think this would make a family a really perfect holiday meal. I would like to make this, but what could I replace the dates with? 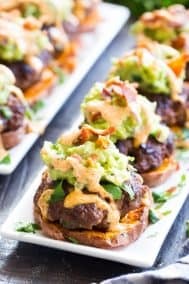 My husband and I are keto, low carb. I am keto as well and I would just leave the dates out. It’s still very good without the dates! Hey i found your recipe while planning a menu for a month of Whole 30. I’d never heard of coconut aminos before so i checked out the link you provided. From what i read it looks almost like a sugar substitute. 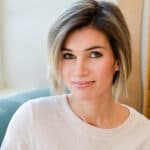 Do you know if this ingredient is whole 30 compliant, and if not will the recipe still taste good without it? I guess i can try it and see for myself, but wondering if you’ve tried it. Ummm…what am I supposed to do with the other half of the bacon? The recipe is not clear as written. 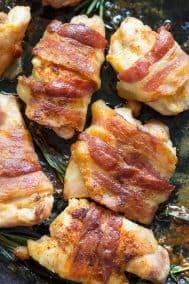 The recipe reads “lay the half strips of bacon over the top of the pork” – you begin with 6 strips of bacon, cut them in half, and lay all the pieces over the top to cover the top of the pork loin. The loins are skinny enough that a half strip is long enough to lay over the top and gently tuck the ends underneath. Does this make sense? OHHHHHH I SEE!!! “Lay the half strips!” not— “lay half the strips!” DUH!!! I read it at least a dozen times that way. THANK YOU! Had this last night and it was delicious. Even my husband who is not Paleo loved it. I mean come on, who doesn’t love bacon wrapped anything? The sauce was perfect – not too overbearing, just right. Thanks so much for the quick response. We actually had this tonight too, the whole family loves it – so happy you guys did too! 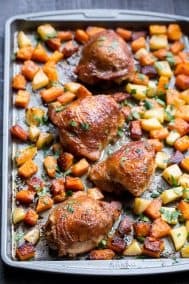 I just made this for dinner and it is now one of my favorite recipes! It was so good!! HI Michele, could I do this in my crock pot? Do you need to use brown mustard? Any dates will do since you can soak them to re-moisten. If you can, get ones that look “gooey” in the package and not too dried out. 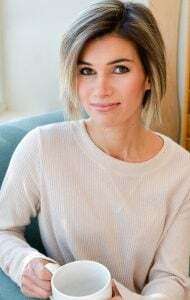 I googled pork loin and whole 30 and found this. Omg- fantastic!! Made this for my family for Valentine’s Day and everyone loved it! This was the best pork loin I’ve EVER made. So moist and delicious!!! I am fixing this for guests…tonight. I found a brand, Nature’s Place that was more ‘clean meat’ but they only had pork chops and loin, not TENDERLOIN> I bought the chops. They are 2 to a pack equalling 1 pound. I bought 3 packs giving me 3 pounds of meat. 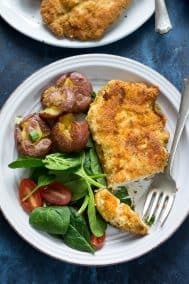 Any ideas on how I might modify this recipe for chops? Hmm, you can probably wrap the chops, brown then on all sides in a cast iron, then add the sauce and finish in the oven or broiler, though I’m not sure what the time would be on that! Anxious to try this! 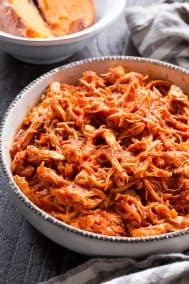 I’m curious – Have you ever made this in a crock pot? I haven’t! Not sure how that would work. The pork wouldn’t be an issue but you’d have to find a way to get the bacon crispy. Holy cow, that was delicious! Took mine about 45 minutes to cook and I don’t think I soaked my dates long enough but it still tasted great. Definitely keeping this recipe handy. Typically we have sweet potato fries or baked french fries, roasted veggies or a green salad, plantains or tostones, butternut squash fries, that sort of thing. We paired this with a green salad (greens, avocado, red onion, Primal Kitchen greek dressing) and baked (hasselback) sweet potatoes. We made this for dinner last night… i had the ingredients all in house, the instructions were easy to follow, and we had a tasty, healthy dinner on the table in under and hour. Thank you for sharing! If I don’t have Coconut aminos could I use soy sauce, or what would be a good substitute. We aren’t following ny specific eating plan. Thx. If you aren’t concerned with sticking to paleo soy sauce, or GF soy sauce would work, use one with less sodium. 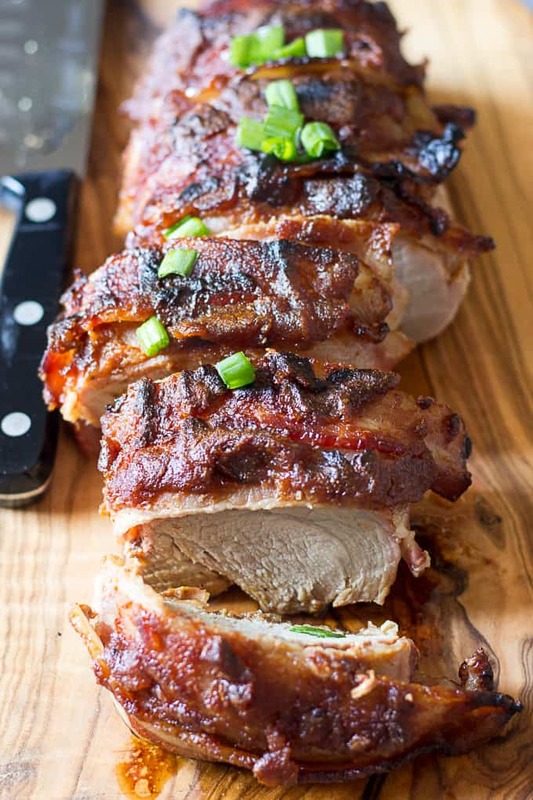 This was hands down the best pork tenderloin recipe I’ve ever had! Thank you so much for sharing. This is amazing! I’ve got it book marked and I plan to use the date sauce on a regular basis. Absolutely delish! This recipe is fantastic! Delicious recipes like this have made our Whole30 journey so much easier. Thanks for sharing! I’m so happy you liked it, yay! I made this tonight and it was awesome! My picky husband even loved it! I’m so thrilled you guys enjoyed it! I just made this in my slow cooker – 5.5 hrs on low and crisped up the bacon in the broiler when it was done. It came out delicious! Wow that’s awesome to hear, thanks for letting me know! Super easy, super delicious! My husband raved. This will be a regular at our house. I have made this recipe a million times. It is huge hit with my whole family. Sometimes I add bacon and sometimes I don’t. I substitute soy sauce for the coconut aminos. Thanks for a great recipe! I made this exactly according to the recipe (rare for me) because it sounded delicious and it really was! This goes in my Whole 30 book as a keeper. I had a 1lb 4oz tenderloin that I cooked for 30 minutes and it was about 5 minutes too long but otherwise it was mouthwateringly yummy. We’re having leftovers tonight – that good!